On Monday, February 21, we got up early once again. 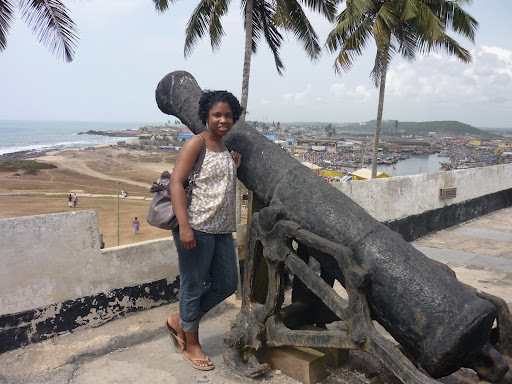 This time, we headed to the Cape Coast. The journey was long, but the trip was scenic. The roads were outlined by all the trimmings of a tropical climate including bamboo and palm trees. What was interesting to me, in addition to the actual views from the car, was the way in which people drove. The roads headed to the coast were 1-lane highways (1 lane for each direction of traffic). So overtaking (passing) was the name of the game. We swerved around potholes, neglected speed bumps, and overtook and were overtook any chance possible. The journey was also marked with people selling their goods up and down the highway. The women were carrying goods on their head with incredible posture and poise. They carried everything from water to fruit and had their babies strapped to their back. The only thing I could say to myself was, “wow – the strength of a woman”. As we got closer to the coast, I could see the beach, the Atlantic in the distance, and the waves crashing on the beach. A few canoes showered the beach, but there were no swimmers. Our first stop was the Elimina slave castle once owned by the Portuguese, Dutch, and British at some point. It was used for many purposes, but the most significant was its use in the salve trade. The castle left much to be desired aesthetically and the rooms were bare with no staging of how it may have looked during the time. However, its massive structure and position is somewhat out of place. It sits overlooking the city of Elimina and in the near distance, another castle loomed on top of a hill. The cannons were directed facing the city. By the locations, the castles stood in locations of power and privilege with the small town at their feet. As we left the castle, we were on a hunt for pineapples. My friend assured me that the pineapples in this region were of top quality. We tried unsuccessfully at a few places and finally got hold of some pineapples and someone who could cut it for us. Without wasting much time, we devoured our pineapple and headed towards Kakum State Park. My friend, having bought many of her friends and family here previously, opted not to go on the walk through the forest or the canopy walk. I didn’t know what to expect other than a leisurely walk through the forest. She asked me if I was afraid of heights and I couldn’t imagine how high up we would be going. Once we started ascending into the forest and reached the first canopy, I was frightened. I started becoming nauseous and dizzy. I managed to wak over all 7 rickety canopies at the encouragement of an 80 year old women. I was a bit disappointed that we didn’t see any wild life. However, we did get to see some greenery (like the trees that palm wine is tapped from). As we left Kakum, we stopped along the side the road to enjoy some grilled plantains from a stand. I believe I had plantains everyday while there – along with rice. By the time I got home, I felt completely stuffed and bloated and have been officially detoxing! Wow! A very vivid description. I feel like I was there. Thanks for reading! I just tried to describe the best I could without offering any analysis of what I saw. Better that way since it's only my first time going.